“Artificial intelligence would be the ultimate version of Google. The ultimate search engine that would understand everything on the web. It would understand exactly what you wanted, and it would give you the right thing. We’re nowhere near doing that now. However, we can get incrementally closer to that, and that is basically what we work on.” — Larry Page, Google Founder. We live in an age of artificial intelligence, the time when cutting edge technologies reinvent human experience. In the marketing field, the implementation rate of AI-embedded systems grows at a rapid pace, making business more personalized, efficient and cost-effective. According to a MIT global survey, which covered nearly 600 executives across 18 countries, 9 out of 10 companies implement AI solutions in order to enhance the customer journey, while nearly 50% of firms with over 30,000 employees tend to invest significant resources in AI, especially to front-line customer communication and analytics. Artificial intelligence (AI) is an area of computer science, which implies simulation of human intelligence by computer systems. The tasks like learning, making decisions and solving problems are accomplished through the use of AI intelligent software and systems, including speech and image recognition, automation, behavior pattern mapping, computer vision, machine learning, etc. Artificial intelligence marketing (AIM) is a sub-field of AI focused on using customer data and AI concept to achieve marketing goals. AI allows predicting customer digital actions and inactions, simplifying and enhancing marketing initiatives. 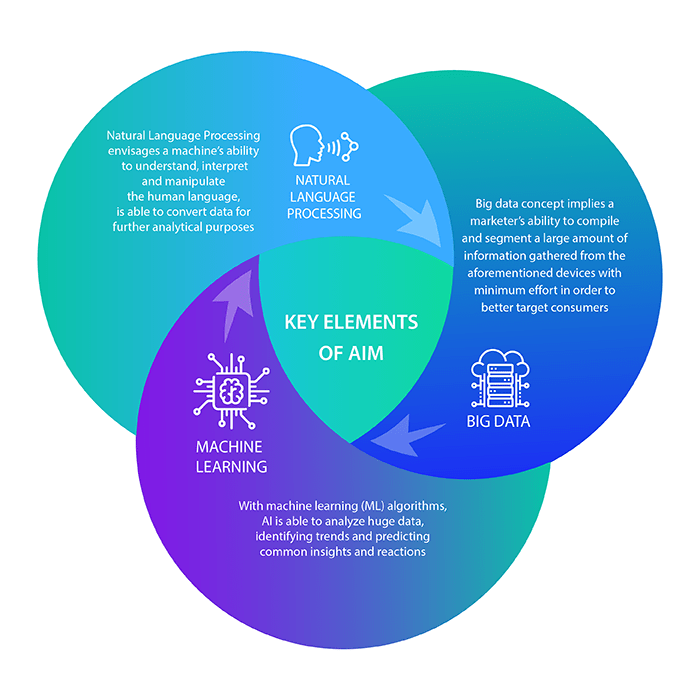 AIM solutions are able to analyze huge amounts of data sets much faster than any human team can, uncovering new insights into customer behavior. AI-embedded technology already disrupts marketing market. According to the study, provided by MarketsandMarkets, the AI in marketing market was valued at USD 5.00 Billion in 2017 and is likely to reach USD 40.09 Billion by 2025, at a CAGR of 29.79% during the forecast period. The main drivers for AI growth, implementation and investment are increasing adoption of customer-centric marketing strategies, a growing demand for virtual assistants, and the enhanced use ofsocial media for advertising goals. 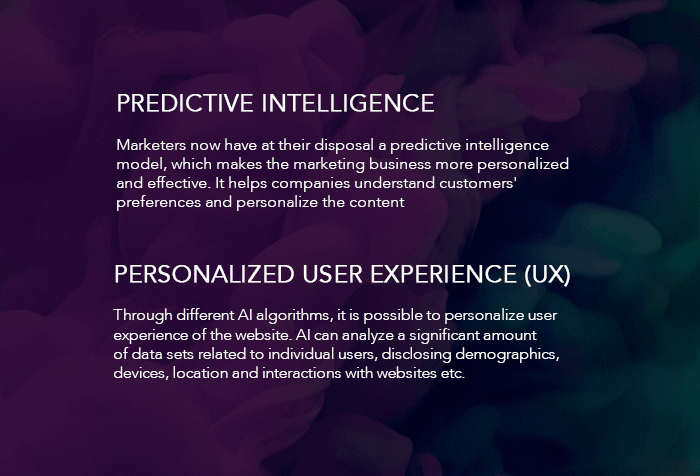 While companies are willing to use AI for customer services, competitive intelligence analysis and media planning, the core interests for marketers lie in personalization, marketing interactions, data analysis and content creation. With AIM solutions, executives can reduce costs, streamline employees tasks, decrease time-consumption due to automation of sales processes, as well as deliver personalized customer experience throughout the entire buying process. According to Forrester, nearly 20% of marketing platforms for B2B marketing will implement AI solutions in order to improve mid-cycle engagement. However, for B2C this number will be significantly higher. Forrester also predicts that AI will not only influence some parts of the customer experience but optimize the whole buying cycle. In today’s digital world consumers are connected through various devices, such as smartphones and tablets, that leads to the creation of multiple customer touch-points across different mediums. Big data concept implies a marketer’s ability to compile and segment a large amount of information gathered from the aforementioned devices with minimum effort in order to better target consumers. With machine learning (ML) algorithms, AI is able to analyze huge data, identifying trends and predicting common insights and reactions. It helps marketers to better understand, foresee and handle problems faster and with more accuracy than their competitors who are not employing ML. Natural Language Processing envisages a machine’s ability to understand, interpret and manipulate the human language. NLP-embedded technology is able to convert highly unstructured data into structured data sources for further analytical purposes. It can also interpret human speech and emotions like humans do, making it possible for NLP technology to analyze social media content, emails or phone calls. AI technologies have greatly contributed to revolutionizing internet searches. Today, people can find everything they need faster than ever before. 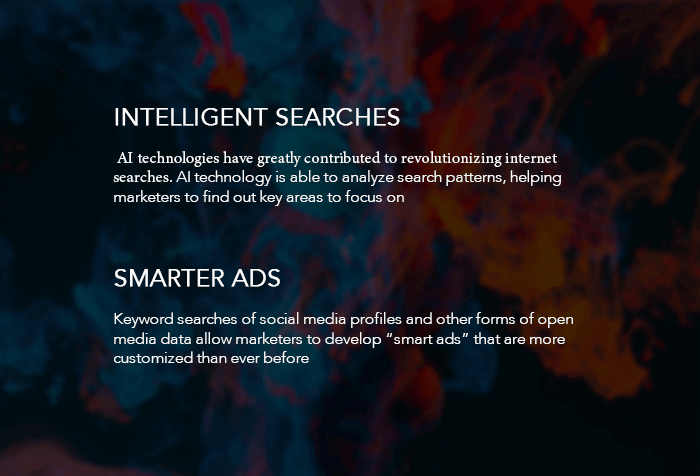 AI technology is able to analyze search patterns, helping marketers to find out key areas to focus on. Keyword searches of social media profiles and other forms of open media data allow marketers to get useful data about the preferences of particular customer groups. On the basis of AI-powered learning, marketers can develop “smart ads” that are more customized than ever before. AI also allows to automatically generate content for patterned texts such as different reports or stock updates. 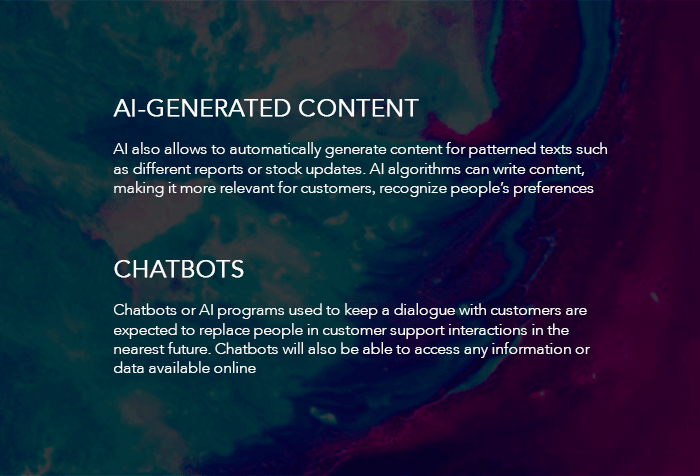 AI algorithms can write content, making it more relevant for customers as AI is able to recognize people’s preferences. The Associated Press, Fox and Yahoo have been using AI-embedded techniques for smart content creation for quite a long time. Chatbots or AI programs used to keep a dialogue with customers are expected to replace people in customer support interactions in the nearest future. Chatbots will also be able to access any information or data available online and answer customers’ queries in real time, thus making the support service more efficient. Replacing their staff with chatbots will allow companies to increase the effectiveness of the utilization of human resources. Marketers now have at their disposal a predictive intelligence model, which makes the marketing business more personalized and effective. It helps companies understand customers’ preferences and personalize the content that will appeal to individual interests. By applying the predictive intelligence method, marketers can get an insight into the preferences of customers and target their marketing efforts accordingly. With AI predictive solutions companies can deliver the right message to the right person at the right time. Through different AI algorithms, it is possible to personalize user experience of the website. In essence, AI can analyze a significant amount of data sets related to individual users, disclosing demographics, devices, location and interactions with websites etc. in order to develop an appropriate website model. A well-developed User Experience helps to increase the number of users browsing a site. The more time they spend on the web, the higher is the possibility of stimulating their interest in the products of the company that owns the site. The Economist has been implementing AI programmatic advertising and reaping its benefits for quite a while. As the magazine had started to lose attractiveness to its audience, it decided to apply AI-embedded technologies in order to attract more readers. By analyzing web/app use, the Economist was able to identify readers’ interests and needs so as to better target them. This campaign succeeded because of data gathered and analyzed by AI-fueled techniques. A Royal Dutch Airline, KLM, has invested in a Blue Bot, named as BB virtual assistant, which help passengers to book tickets, send confirmations, deliver flight updates, as well as answer customer queries in real time. Without this virtual assistant, KLM would not have managed to record nearly 1.7 million messages sent by 500,000 people. The BB virtual assistant allows KLM passengers to get more efficient and faster support service. According to Statwolf, by applying AI solutions Netflix saved $1 billion in 2017. Netflix managed to eliminate competition by optimizing its personalization campaign, streaming relevant content to their customers, making its TV shows and movie recommendations more user-oriented. As Amazon implemented AI-powered solutions, aimed at optimization of product recommendation processes, they claimed that AI helped them to enhance a third-quarter sales by up to 34%, which equals $43.7 billion. Amazon also launched the Echo Look program, which is based on machine learning techniques and uses a hands-free camera assistant. Customers can ask Alexa, the Amazon’s voice assistant, to take a picture or video of their outfit and then post it in social media. Additionally, Style Check feature allows comparing different outfit looks in order to rate them. As an active technology on the rise, AI can optimize a significant number of business processes in the marketing industry. Implementation of AI solutions can streamline not only employees work, but also solve customer problems. Cost savings, budgets optimization, simplifying employees tasks, efficient time-management as well as personalized customer experience – are the main drivers for the adoption of AI-powered solutions in your marketing campaign. In today’s dynamic world, AI marketing helps companies get better insights for their success and allows them to stay ahead.